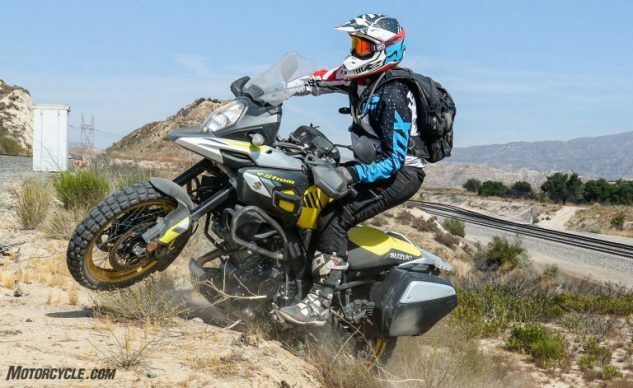 Our V-Strom 1000XT didn’t win the big 2018 Big-Bore Adventure Touring Shoot-Out, but then it didn’t lose either: Fourth place (out of six) isn’t bad for a bike that undercut the next least expensive bike in the test (Honda Africa Twin DCT) by $1600, and the most expensive one (BMW R1250 GS) by $9,000. Alas, it is time for the Suzuki to return whence it came. We only put 800 miles on her while she was in our care, but a few of them were rough miles indeed, as we like to exclaim Italically at the big magazine when we really mean it! How’d she hold up? The worst of our damage occurred, apparently (yours truly was not on this ride and bears no responsibility!) when some unknown enemy action broke the left front bag mount off. 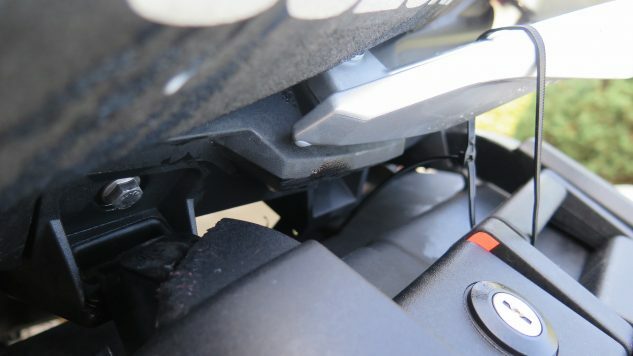 That front mount is a plastic prong that hooks into the subframe, and we’ve seen this movie before with other brands. 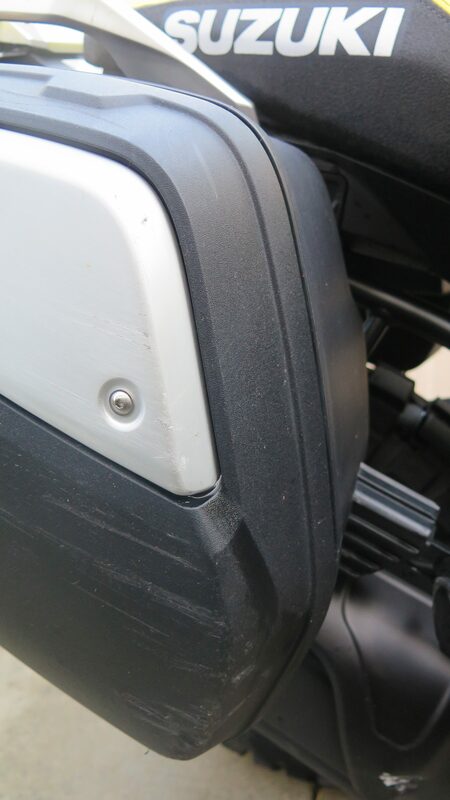 In fact, the Africa Twin uses plastic prongs also – but on it, two screws attach each prong to the bag, making the prongs easily replaceable. No such luck on the Suzuki. The broken-off prong is there on the left, just beneath the bolt head. It’s a molded-on part of the bag, and that’s an expensive bummer. Zip ties are an important thing to carry; this one held the bag on well enough to get home. And then some. The right bag got scuffed up a bit also, but managed to maintain its mount’s integrity. In fact, judging from the right crash guard, it doesn’t look like whatever smote the Suzuki’s right side was just a glancing blow. 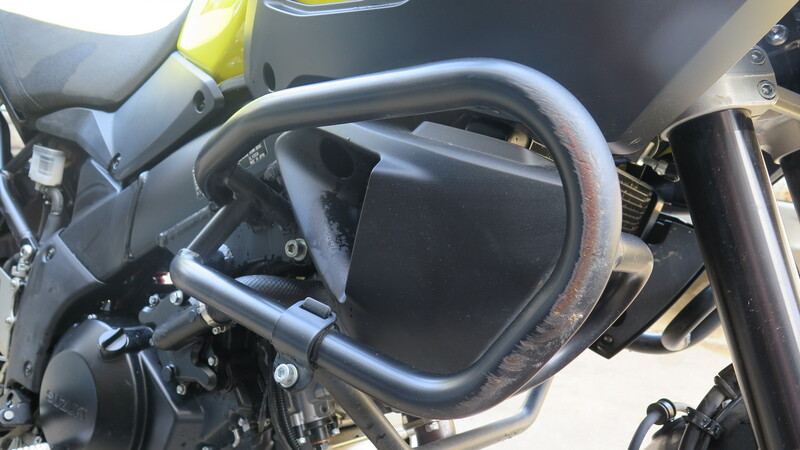 Aside from the scuffed crash bar, a scufffed bar-end weight, light scratches to the right handguard, and some scuffing on the muffler shield – the rest of the right side looks fine. Fine being defined as, having added character in the form of duelling scars, I guess. Both the shift and rear-brake levers are cast aluminum, and though both suffered some dings, neither one broke. And though they’re only plastic, the handguards kept the clutch and front-brake levers safe. 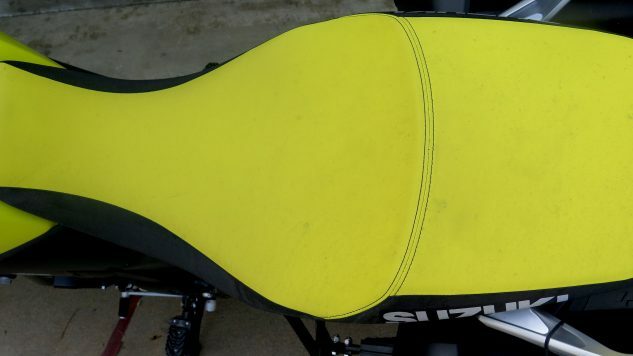 Aside from the broken bag mount, the other annoying bummer is the way the yellow vinyl of the seat has come to look after being left parked outside for a couple weeks. Dark pockmarks all over had it looking as if it had contracted some kind of fungal infection. We finally got rid of 98% of it with a bleach solution and quite a bit of elbow grease, but as long as Suzuki’s been making saddles you’d expect a better grade of vinyl or something? Considering the kind of abuse the poor thing went through, though, overall the `Strom came through mostly unmolested, with all mechanical systems intact and strong as ever. Shame about that bag. May we have the next victim, please.